Traditionally studies on colon cancer in younger patients have focused on treatment and outcomes. Less is known regarding younger patients’ symptoms at presentation and methods of diagnosis. 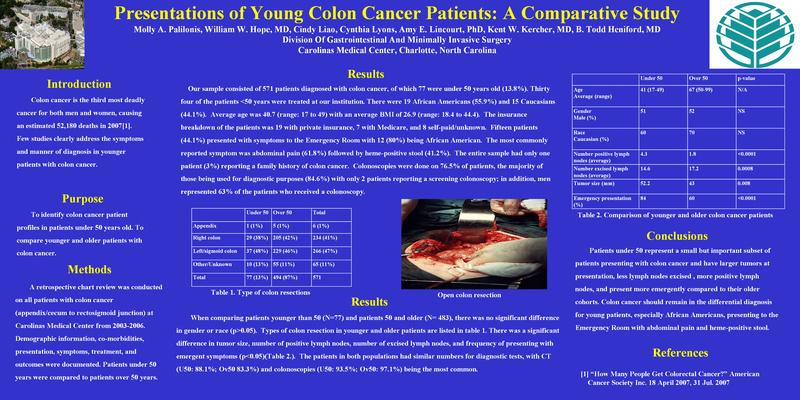 The purpose of this study was to compare the presentations of colon cancer patients under 50 versus their over 50 cohorts. The tumor registry database was used to compare patients diagnosed with colon cancer from December 1, 2002 to December 28, 2006 under and over 50 years of age. Method of diagnosis, treatment and outcomes were documented.